I have a pet peeve. I really get annoyed when I go to a store to make a purchase and the clerk acts like I’m not even there! No eye contact. No “how are you today?” Not even a thank you. It really leaves a bad taste in my mouth. I’m also not fond of not receiving thank you cards. Is it too much to ask? Has saying thank you become passé? Don’t get me wrong. There are plenty of people that haven’t forgotten the old ways. I do run into people that say thank you and I do get thank you cards from some. But all too often we take manners for granted and do not realize the importance they hold in our lives. Being in customer service, I am on the phone and interacting with our customers daily. In order to assure them that I appreciate their order and the opportunity to serve them, I must convey with my voice. I do this by smiling and being helpful. No, it can’t be seen, but they can hear in my voice that I truly care. When I am dealing with an individual on a more personal level, I convey my thanks not only in person, when I can, but I follow it up with a thank you card. 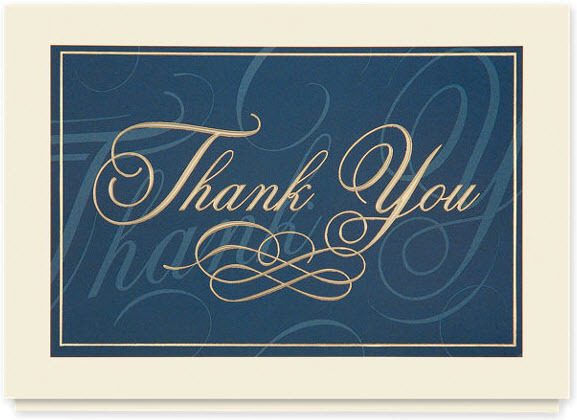 Whenever I purchase my all occasion cards, I make sure that they include thank you cards. When the occasion arises, I have it at the ready. Whether in business or personally, and under appreciated person is an unhappy person. Either way, it’s a recipe for disaster. I don’t want to be the person responsible for that! I believe that thank you cards are a very nice gesture and necessary. Individuals feel appreciated when they recieve thank you cards. It also goes to show that the person sending them also took the time to write these cards in appreciation for what you did. It is never a bad thing to let others know how thankful you are, no matter what the occassion is. I completely agree! Manners seem to be falling out of fashion with many people. However the small effort of a thank you card when someone has helped you or done something nice still means a lot to some. This is very true! A Thank You always makes a great impression and it is forgotten too often. I am glad to see that others agree on this and hope that being polite in this way never is lost completely! I have made it a point to make sure I taught my kids to send thank you notes after they receive birthday gifts. It is necessary that the importance of showing gratitude is passed on to our children. Having worked in retail I understand the importance of greeting a customer and thanking them for shopping in my store. It conveys to the customer that you really do appreciate their business. But boy did it bother me when I greeted a customer and was totally ignored.. So have manners in general become passé? this is so true. I mean, I don’t really expect a thank you card for every little thing, but I do like to know my efforts and thoughtfulness are appreciated. if you don’t show me any gratitude at all, I’m way less likely to go out of my way to be nice to you in the future. I agree that under appreciated people are not happy people. I hear my friends complain all the time that their supervisor never commends them on a job well done. It’s not just a problem at work either. My mom frequently pointed out to my siblings and I that we rarely acknowledged when she did something extra special for us as kids. Now that we’re adults we are more careful to recognize her efforts and not just with a call but also with a card. She especially enjoys receiving mail from her children.